White not compromising on taste, this hearty soup is relatively quick and easy to prepare, meaning you can have a meal-in-a-bowl on the table in less than 20 minutes. 1 Heat oil in a large saucepan over a medium heat. Add curry paste and fry for 1 minute, stirring continuously. Add tomatoes and 4 cups cold water and bring to the boil. 2 Stir in red lentils, turn down the heat and simmer gently for 10 minutes. Add grated carrot and simmer for 5 minutes more, or until lentils are just tender. 3 Adjust seasoning with salt, to taste. 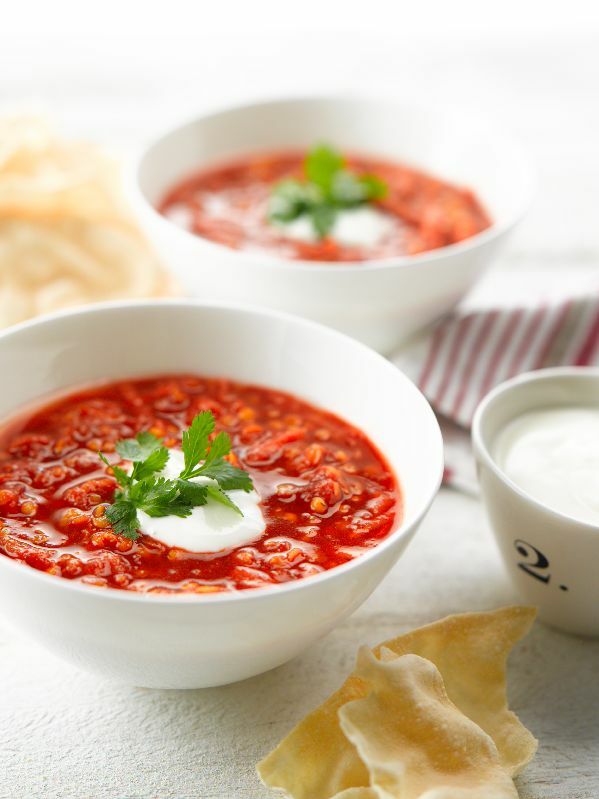 Serve in bowls, scattered with chopped coriander and with yoghurt on the side, to spoon over. Serve pappadams on the side, if desired. Chef’s trick: Cooking poppadams in the microwave is quick and easy, and healthier than deep fat frying them. Simply microwave one at a time, for 30 seconds each on high, or until poppadams are nicely puffed.